If you want to find the best way to Zerg rush your opponent in StarCraft II, it might be best to leave it to survival of the fittest. StarCraft II, like most strategy games, is a very complicated game. While the middle-to-late parts of every match essentially turn into a giant cycle of fluidly reacting to (and trying to predict) what your opponent is doing, the early phase of any given battle heavily revolves around "build orders." That is, what buildings and units should you build when, and in what order, to give you the best army for early-game skirmishes? 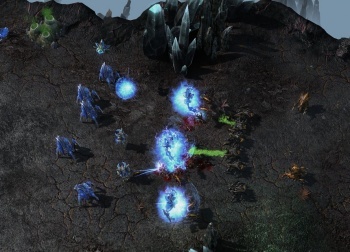 Much like openings in chess, build orders are one of the most hotly debated concepts in the competitive StarCraft community, since they can set the tone for a whole game - and one StarCraft II fan who goes by the name Lomilar has set said community ablaze with a computer program that has unearthed new build orders that are wholly unintuitive and yet devastatingly effective. The program, fittingly called "EvolutionChamber" - a Zerg structure in the game - uses "genetic algorithms" to find the most powerful early-game build orders. In simpler, non-computer-science terms, it takes every possible build order and makes them fight to the death in order to see which comes out on top. There's an excellent in-depth explanation found here that lays everything out in terms that are easy to understand for non-programmers and non-StarCraft players alike. In the end, all that you need to know is this: By doing things that go horribly against conventional StarCraft II wisdom, the algorithm came up with a Zerg opening build order to get 7 Roaches (an early assault unit) nearly a minute before a "standard" rush would produce 5 of them. That's an eternity in StarCraft terms. Like every strategy in a good RTS, the build has a counter if you can predict that it's coming - and once you get past that initial skirmish all "build orders" go out the window. Not that it makes its existence any less impressive, mind you. If you have a few minutes to spare, the writeup is a fascinating read, even if you don't play StarCraft. The algorithm isn't a perfect StarCraft II pro, though: It might be able to come up with awesome new strategies, but it'll never be able to take to the forums and whine after its favorite tactic gets nerfed.